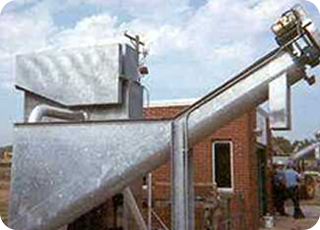 WALKER PROCESS EQUIPMENT – LAI, Ltd.
Bridge & Pier Supported Center Feed Clarifiers, Rectangular Collectors, Grit Removal & Grit Washing Equipment, Digester Covers, Anaerobic Digestion Mixing and Heating Equipment, STAMO Mixing System. 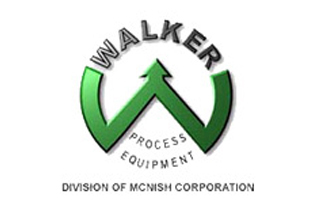 Since 1946, Walker Process Equipment has been a premier supplier of the highest quality engineered and manufactured equipment to the Water Environment Industry. Walker Process offers proven technologies for biological treatment, anaerobic treatment, wastewater clarification, digestion, separation, and sludge treatment. Many of Walker’s installations continue to operate after 40 – 50 years of continuous service as a result of our comprehensive engineering and desire for quality at every step of manufacturing. Our products are designed and manufactured based on our 60+ years of experience combined with the most advanced engineering know-how. All key components of Walker’s products are manufactured at our facility in Aurora, IL. Rolling Grit Equipment from Walker Process provides a total system for grit removal and dewatering. Efficient grit removal is a necessity to provide protection from the abrasive effects of grit on plant equipment and to prevent high grit loads on digesters. In the grit basin, a centrally located eductor tube induces a rolling action that maintains organics in suspension while causing settled grit to be carried to a center hopper where an airlift pump transfers the grit to an inclined screw GritWasher external of the basin. Important features of the Rolling Grit design are that preaeration is provided and the absence of moving parts in the grit basin reduces costly maintenance associated with screws or chain and flight mechanisms. Single units to 21 MGD Peak Flows. 8′ x 8′ x 10′ AWD to 30′ x 30′ x 14′ AWD. Provides a total grit removal and handling system. Includes grit collection (RollAer Unit), removal (GritLift), cleansing and dewatering (GritWasher or HydroSeparator). Plant air supply or separate low horsepower blower can be used. Multiple units in long rectangular basins do not require partition walls. Requires only minimum operator attention. Simple air monitoring maintains the unit’s efficiency. Dewatering and cleaning of grit after removal from plant flow. There are four (4) different sizes and they can be equipped with either a direct drive or the chain and sprocket type. A “tail-end” lift-out device is also available. Drawings for all these options are available. Can be made of stainless steel. Helical screw can be supplied with 3/8″ No. 60 Hardex weld on leading edge. Lubrication fittings located at critical points for easy maintenance. Housing includes overflow box with adjustable weir and energy control inlet. Grit collection and removal. Also, grit dewatering. Tank sizes from 8′ x 8′ x 3′ AWD to 40′ x 40′ x 5′ AWD. Flow deflectors evenly distribute inlet flow across entire tank width. Utilizes heavy-duty circular collector type grit collector. Steel flights with replaceable wearing plates. Either Inclined Dragout or Helicoid Screw may be applied for grit removal. Low horsepower requirements for grit collector and removal units effect energy savings. Type M RotoSeal rotary distributors are applied to uniformly distribute wastewater over trickling filter rock or media to ensure uniform filter loading. Flow is introduced at the mast or center column and manifolded to the arms, which are fitted with orifices and spreaders. The distributor is driven by hydraulic reaction and is available with two or four arms and overflow controls depending on flow range and head requirements. Orifices are adjustable for future variations in flowrates. For filter bed diameters up to 175 feet and nominal flow rates to 5,000 GPM. 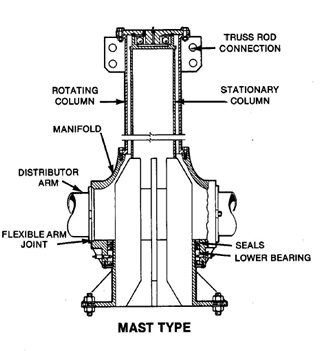 Type MT RotoSeal rotary distributors are for higher flowrates or larger filter diameters requiring greater bearing capacity than is available with Type M rotary distributors.Type MT mast-tub rotary distributors, as well as Type M rotary distributors, use a main support bearing at the top of the mast which prevents exposure of the bearing to sewage and ensures easy maintenance and long life. A large, open top, inlet tub is used on MT units rather than an enclosed manifold; otherwise, the design features are similar to M type units. For nominal filter bed diameters to 250 feet and flowrates through 25,000 GPM. 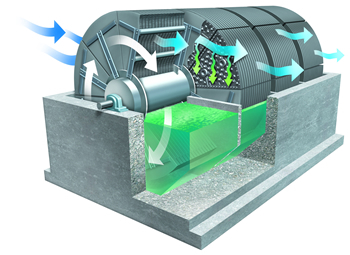 EnviroDisc Rotating Biological Contactors (RBC) provide highly efficient fixed film BOD and ammonia removal with low energy usage and maintenance requirements. In the RBC process, wastewater flows through shallow tanks containing the partially submerged, rotating shafts where biomass is carried on the media for reduction of pollutants. The EnviroDisc utilizes a framework to support the removable media. The shaft is a 30″ diameter, 3/4″ thick wall. This is the largest shaft available and is structurally superior to any other in the marketplace to provide a rugged design capable of an extended fatigue life. The EnviroDisc also utilizes either a direct or a shaft-mounted drive. Shafts are available in 11′ 10″ diameter, 26’0″ nominal length, in both 100,000 square feet and 150,000 square feet media area, and also several shorter lengths for small plant applications. The RS Thickener mechanism consists of two fabricated steel arms supported from a central rotating drive cage. 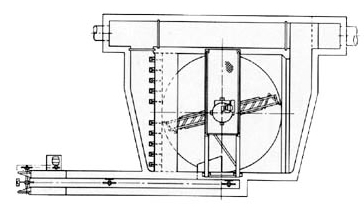 The cage is suspended from an enclosed spur gear drive turntable unit which, in turn, is supported on the center pier. The driving unit consists of a special primary double reduction worm gear unit driven through a steel roller chain connectd to a gear motor with all-weather construction. The mechanism is supported from a center pier which may be of steel or concrete and the unit may be used in either steel or concrete tanks. 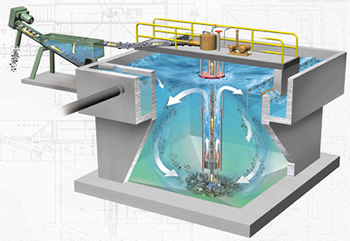 Flow is generally introduced through a pipe brought up underneath the tank and up through the hollow center pier, but it may be brought over the top of the tank through a flume or through suspended from a bridge. Overflow from the tank is collected by a peripheral trough or an inboard trough, each furnished with adjustable serrated weir plates. The C and CP Bridge-Supported Thickener is provided with a bridge which spans the tank diameter and carries the entire weight of the Thickener mechanism and the feed well. Flow is brought into the Thickener through a pipe which may be either suspended from the bridge or brought through the side of the tank. Overflow from the tank is collected in a peripheral weir trough or inboard troughs, each provided with adjustable serrated weir plates. Thickened sludge or slurry is withdrawn from the centrally located bottom hopper. 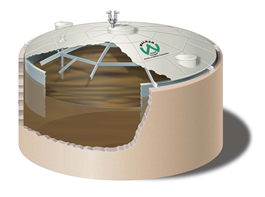 Fixed covers are used in digesters with no variation in total volume, and are often used on the primary digester in a two-stage system. The sludge volume can be varied, but only by varying the gas volume at the same time so as to keep the total volume constant. If gas is to be pressurized for use, it must also have a companion floating cover connected by gas lines. Fixed covers are anchored to the top of the digester tank, and normally there is a static or constant sludge level. Thus the rim plate only need be as deep as the tank freeboard plus the tank operating pressure and an appropriate seal depth to contain the gas. A typical rim plate depth might be approximately 2’6″ with 1’0″ freeboard. A fixed cover has only one steel membrane over its structural framework. A gas dome located at the center of the cover provides a gas reservoir from which gas can be withdrawn without also removing entrained liquid, scum, foam, etc. Sampling wells, usually one near the center, one at about 1/2 radius. These wells have quick-opening hatches, with seal pipe extending below liquid, so that samples can be withdrawn without losing gas. Pressure relief and vacuum-breaker valve, mounted atop the gas dome for the purpose of relieving gas upon over-pressurization, and allowing atmospheric air to enter if vacuum exists when cover on corbels. Basically, this is a safety device, protecting the structure. The advantage to this type of cover is lowest cost. The disadvantages are that it will not pressurize and store gas by itself, will not depress scum, and provides little insulating value.